Researchers discover an initiation mechanism for dendritic spines. Researchers from the University of Helsinki, ETH Zürich, Aix-Marseille and the German Mouse Clinic teamed up to investigate the initiation process of dendritic spines. They discovered that protein called MIM bends the plasma membrane to aid the formation of dendritic spines from the surface of the neuronal dendrite. The team state that the discovery is important, as most of the neuronal connections, called synapses, are build to dendritic spines. In many central nervous system diseases, the dendritic spine density is altered. The opensource study is published in the journal Developmental Cell. Previous studies have shown that cognitive disorders such as ADHD, autism, intellectual disability, and fragile X syndrome, may be resultant from abnormalities in dendritic spines, especially the number of spines and their maturity. The ratio of matured to immature spines is important in their signaling, as immature spines have impaired synaptic signaling. Fragile X syndrome is characterized by an overabundance of immature spines that have multiple filopodia in cortical dendrites. All of the above disorders are shown to be neurodevelopmental in nature. Over the past decade studies have shown that while a net loss of spines is observed in Alzheimer’s disease and cases of intellectual disability, cocaine and amphetamine use have been linked to increases in dendritic branching and spine density in the prefrontal cortex and the nucleus accumbens. Because significant changes in spine density occur in various brain diseases, this suggests a balanced state of spine dynamics in normal circumstances, which may be susceptible to disequilibrium under varying pathological conditions. There is also some evidence for loss of dendritic spines as a consequence of aging. With past animal studies noting a correlation between age-related reductions in spine densities in the hippocampus that and age-dependent declines in hippocampal learning and memory. In the current study the team examined the expression of MIM mRNA during CNS development by in situ hybridization of tissue sections to gain a comprehensive understanding where MIM functions in the CNS. The data findings showed that MIM is strongly expressed in the cortical and neocortical regions indicating that MIM is a highly expressed gene during CNS development. This could be a possible link to the inception of autism at a neurodevelopmental level. To further validate the link between MIM and the initiation process of dendritic spines the team developed MIM-deficient mice and compared these to control mice during neurodevelopment. The team performed spine phenotype analysis and fluorescently tagged the dendritic spine formation at various stages of neurodevelopment. The results showed that overexpression of MIM increased the density of dendritic protrusions and suppressed spine maturation. In contrast, MIM deficiency led to decreased density of dendritic protrusions and larger spine heads. Moreover, MIM-deficient mice displayed altered glutamatergic synaptic transmission and compatible behavioral defects. The data findings identified an important morphogenetic pathway, which initiates spine protrusions by coupling phosphoinositide signaling, direct membrane bending, and actin assembly to ensure proper synaptogenesis. The team state that understanding of the molecular mechanisms underlying the initiation process of dendritic spines enables us to manipulate their initiation rate and density. Furthermore, they say that this will help the medical community to understand the molecular basis of learning, as new spines are readily initiated during learning. The researchers go on to add that in future, this knowledge can be helpful in the development of therapeutic interventions for neurological diseases underlined by altered dendritic spine density, such as autism spectrum disorder, Schizophrenia or Alzheimer´s disease and now plan further studies in this area. MIM Protein Bends the Plasma Membrane and Initiates Dendritic Spines. 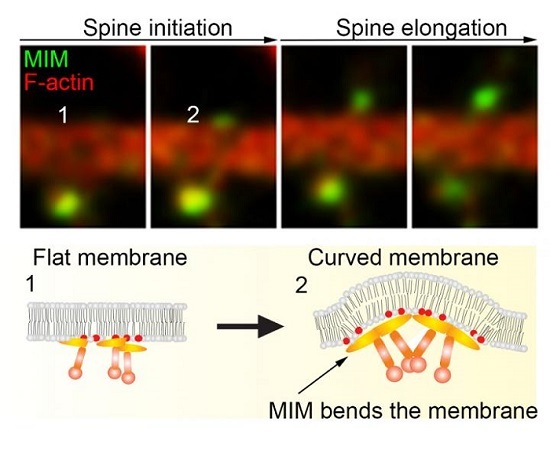 This image shows time frames of MIM and F-actin dynamics during initiation of dendritic spine. MIM initiates dendritic spines by coupling phosphoinositide-signaling, direct membrane bending and actin assembly together to ensure proper synaptogenesis. Credit: Pirta Hotulainen and Juha Saarikangas.